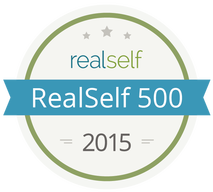 Read our 5-star reviews on RealSelf and see why our patients have an exceptional experience.
" I can't say enough about how impressed I am with Dr. Hayes's surgical skills and my recovery have been absolutely amazing!" "Absolutely Perfect Experience, Results & Recovery. Dr. Hayes is absolutely the best at what he does and the results show that!" 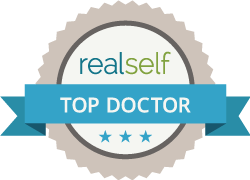 "From the moment I began speaking to him about doing a breast augmentation surgery you could tell he had my best interests at heart and was very honest and offered great expertise." 37 year old mother of 3, very active runner. Dr. Hayes has exceeded my expectations. During my consult Dr. Hayes answered every question and concern I had. ( I had 4 pages) The consult was only supposed to last 1 hour. My husband & I sat with Dr. Hayes & talked for over 2 hours. During that time Dr. Hayes never made us feel rushed or that we had taken up too much of his time. I live about 2 hours away so after talking in his office I was able to try on sizers. Dr. Hayes took so much time with his measurements of my breasts and guiding me as to which brand, shape and volume of implant would work best for my natural breast footprint as well as my active lifestyle. I didn't want to look out of proportion. I was wanting a very natural look. We very much agreed on the look I was hoping to achieve. We talked about what days he schedules surgeries (which is Tuesday and Wednesday.) I was really needing surgery to be on a Thursday, due to my husband being able to take time off work. Upon leaving his office Dr. Hayes gave me his email address to contact him should I have any questions. The very next day I called to schedule my procedure. Dr. Hayes had arranged with the surgery center to do my procedure on a Thursday to fit my schedule. Dr. Hayes and I emailed back and forth a few times. He answered all of my questions in a very timely manner. Surgery day went perfect. Dr. Hayes met with me in the pre-op room and went over everything again. Type of implant, size, placement, incision type, all the risks involved. He made sure that I was very informed. After the procedure I went back to my hotel for my 2 hour nap. I showered, did my hair, make-up and started my arm raises. I then walked slow laps around the pool while my husband played with the kids. Dr. Hayes text me to check how I was feeling. We saw him the very next day in his office. Everything looked great. We went home. I have been in contact with Dr. Hayes via text everyday since surgery. His availability to his patients is unlike anything I've ever seen or heard of. He truly cares for his patients and you can tell he takes great pride in doing amazing work. I am 4 days post-op and feeling great. Only took 2 vicodin after surgery and have had very little discomfort. Mostly feeling pressure, a little burning sensation as my body settles in with the implants & some mild muscle soreness as the implants were placed under the muscle. Today is day 4, I feel great. Still taking it slow and easy. I don't know how he does it. My breasts look so natural already and I feel amazing! 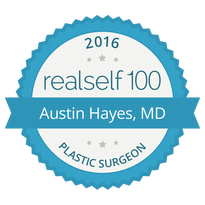 If you are looking for a great, highly skilled surgeon, a doctor who cares and listens, a doctor who will see you as an individual, you can stop looking now and just call Dr. Austin Hayes, he is THE BEST!! ​36 Years Old, Active Mom Needed a Little Love in the Breast Dept. I always knew I wanted to get a breast augmentation and after having my daughter that was confirmed. A friend referred me to Dr. Hayes and I scheduled my consult. After meeting with him I knew I was in good hands. He was up to date on the latest procedures and incredibly confident. Also, his bedside manner was comforting. Concerned about size and many other things, I had questions. He never hesitated to answer them thoroughly and honestly. I wanted to be on the more conservative side and he listened. We decided on the size and scheduled a date. The experience in itself wasn't bad at all. I went in, walked out with two waterproof bandaids, went home and slept off the anesthesia then started doing arm raises just a few hours post op. I was sore but never in pain. I have zero regrets. Dr. Hayes does beautiful work. I also received Botox from Dr. Hayes, it has been the best Botox experience yet. I've had Botox a few other times and haven't been completely happy with the results. After sharing that with Dr. Hayes, he knew exactly where to place it to give me the look I was hoping for. Not only is my forehead smooth but my crows feet are gone. Everything with Dr.Hayes and his staff was amazing. Veronica was the most amazing woman to deal with and be greeted by through all of my appointments, She made scheduling a breeze and always accommodated my busy schedule. Doctor Hayes made sure I was confident and comfortable in every choice and step along the way. I had his cellphone number for after surgery and email which he expressed for me to use as much as I needed and to never feel hesitant to reach out with any question/concern big or small. The times I did have something pop up Doctor Hayes was so fast to respond and clarify anything I needed. The office was very clean comfortable. Start to finish Doctor Hayes maintained the most professional attitude and bedside manner always keeping me feeling 150%. Dr. Austin Hayes in Hillsboro, Oregon performed my surgery right there at the surgery center in same building as his office. The whole team was great! Everyone so thoughtful and caring! Right from our first visit he went over and beyond on letting me know everything right up front, he is very detailed about everything. He takes his time answering any and all questions you have, he don't rush through it he makes sure you fully understand everything involved. He is very knowledgeable and helpful through the whole process. He called me and personally talked to me before scheduling to make sure I fully understood everything ahead of time. He gives you his email and you can email him directly with any questions, he is very prompt on getting back to you. Never makes you feel like your bothering him. Since I live out of town he worked with on the surgery time so I didn't feel rushed. He talked to me and did my prep the morning of surgery. Everything went great turned out just as he said it would. Gave my friend that was with my his cell number in case we needed to get ahold of him during the night after surgery. After my surgery he texted me and called me several times to see how I was doing. I had his cell phone number to call anytime to keep in contact if I had any concerns or questions and to let him know how things were going. I'm so glad I choose DR. AUSTIN HAYES to do my surgery, I don't think you could find a more caring up front doctor than Austin. I'm VERY VERY SATISFIED with how everything went from our first visit to my six week check up. In fact for my six week check up instead of me driving all the way to Hillsboro, Dr. Hayes came to his Hood River office and met me so I didn't have to drive so far. Im very happy with the way my lift and implants look, HE DID A FABULOUS JOB! I would recommend him to anyone thinking about having this surgery, You wont be disappointed! You will actually be surprised on what a great skilled and caring doctor he is. I PROMISE! Veronica in the office is great, she'll help you with all your paperwork and appointments!! Thank you Austin for everything! I'm very happy! Best doctor I could have found! I am so grateful for his expertise in this field. He helped every step of the way & answered any questions I had. I went from a 34B to a 34D and am extremely satisfied with my results as my breasts look and feel very natural. I wouldn't recommend any other doctor. Dr. Hayes was so amazing. His bedside manner was unlike any I have ever experienced. He really has a way of putting you at ease. His responsiveness was unparalleled by any Doctor I have ever seen. He answered e-mails with an hour usually, and he was happy to call when I needed to be tales through a concern I had. His office staff was equally amazing. I was treated with the utmost care and respect from start to finish. My anesthesiologist (Bruce) was amazing too, right down to putting Chapstick on my lips as I was being put under because he didn't want me to wake up with chapped lips. I had my surgery two days ago now, and already I can see that my implants are going to heal and look exactly like I wanted them too. I will post pictures soon! I would recommend Dr. Hayes to anyone, he is a compassionate and meticulous surgeon who takes pride in the quality of his work. Dr. Hayes was very patient, kind and professional. He took the time to sit down and review my options with me and answer my never ending questions. Post surgery he would check in periodically and make sure I was feeling well which showed he truly cares for his patients. He was so helpful and honest when picking out the final size which also helped tremendously. Am overjoyed with the results and service he provided! Dr. Hayes has been AMAZING. He is incredibly patient and willing to help. He was the first surgeon I had a consultation with, I checked 3 more out after him because I was told to do so and kept feeling like Dr. Hayes was the guy! He emailed me personally and spent hours answering my questions and never pressured me into using him. He listened to what I wanted and suggested sizes that I was comfortable with. All 3 of the other surgeons pushed me to a much bigger size and I felt rushed through all my appointments. Dr Hayes didn't make me feel like he was a surgeon and superior like others had, but more of a friend that talked me through the process. His office gal is super sweet and funny! She made me feel at ease right away. The office is beautiful and super clean. I'm confident I picked the right guy!! It's been almost 2 months since I had my breast augmentation and they look fabulous! I couldn't be happier!! After having consultations with 4 different doctors, I picked Dr Austin Hayes. I am SO glad I picked him, he happily answered ALL my questions and emails before and after surgery. He spent so much time with me and made me feel like I was his only patient. I was really nervous to get the BA but he answered the hundreds of questions that I had and I never once felt pushed into it. I couldn't ask for a better doctor and staff, they were great. He is patient, knowledgable, friendly, and does beautiful work! I can honestly say I had no pain after the procedure either! I don't know what he did but he has magic hands! He is absolutely wonderful! If you're looking for a surgeon, Dr Hayes is the guy!